YGOTAS. . Wallpaper and background images in the Yugioh The Abridged Series club tagged: yugioh abridged ygotas yugi. wait are they supose to taiste like yugi or something?i dont know how they are supose to test that. I have to test it. I'm the official taste tester for Yugio's. 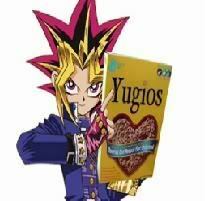 They do taste like Yugi. they made me taste Yugi before the cereal. Please dont ask me which part of Yugi I had to taste. I FRIKING LOVE YUGIOH ABRIGED AND I LOVE THE YUGIOHS COMMERCIAL!!!! I would buy this if it was a real cereal.